Colour: Pale golden yellow in colour with a delicate persistent bead. Bouquet: Rich yet subtle bouquet of hawthorn, almonds and toast. Palate: The inclusion of reserve wines gives wonderful complexity and roundness to thefresh creamy palate. Champagne Louis Roederer Brut Premier strikes a perfectbalance between the structure and fruitiness of the Pinot Noir and the fi nesse of theChardonnay. Recommended Retail $230.00 per Magnum. Serve well chilled. 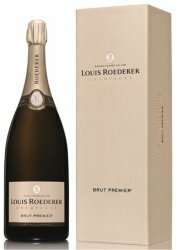 Louis Roederer Brut Premier is a classic aperitif or celebratory Champagne. The fullness and structure make Brut Premier a superb accompaniment to many fine cuisine. Champagne Louis Roederer, founded in 1776, remains one of the very rare family Champagne businesses. For two centuries, six succeeding generations have been inspired by the same concern for quality. Frederic Rouzaud took up the reins in early 2006 from his father Jean-Claude Rouzaud who remains Chairman of the Board. Jean-Claude, grandson of Madame Camille Olry-Roederer and himself a trained Oenologist had led the company for 38 years, and is referred to as the 'Sage' of Champagne (the wise man of Champagne). Frederic has spent the past 10 years working with his father in all areas of production and business and will bring his great business acumen and academic background to the company. Louis Roederer is unique in Champagne owning two-thirds of the vineyards for their total production covering the Pinot Noir sub regions of "Montagne de Reims" and "Vallee de la Marne" with Chardonnay from the "Cotes des Blanc". By 1995, recent acquisitions had increased Louis Roederer's holding from 180 hectares to almost 190 hectares, ranking 97.5% on the official classification scale.